In vivo mammalian models of critical-sized bone defects are essential for researchers studying healing mechanisms and orthopedic therapies. Here, we introduce a protocol for the creation of reproducible, segmental, femoral defects in rats stabilized using external fixation. Kerzner, B., Martin, H. L., Weiser, M., Fontana, G., Russell, N., Murphy, W. L., Lund, E. A., Doro, C. J. A Reliable and Reproducible Critical-Sized Segmental Femoral Defect Model in Rats Stabilized with a Custom External Fixator. J. Vis. Exp. (145), e59206, doi:10.3791/59206 (2019). Orthopedic research relies heavily on animal models to study mechanisms of bone healing in vivo as well as investigate the new treatment techniques. Critical-sized segmental defects are challenging to treat clinically, and research efforts could benefit from a reliable, ambulatory small animal model of a segmental femoral defect. In this study, we present an optimized surgical protocol for the consistent and reproducible creation of a 5 mm critical diaphyseal defect in a rat femur stabilized with an external fixator. The diaphyseal ostectomy was performed using a custom jig to place 4 Kirschner wires bicortically, which were stabilized with an adapted external fixator device. An oscillating bone saw was used to create the defect. Either a collagen sponge alone or a collagen sponge soaked in rhBMP-2 was implanted into the defect, and the bone healing was monitored over 12 weeks using radiographs. After 12 weeks, rats were sacrificed, and histological analysis was performed on the excised control and treated femurs. Bone defects containing only collagen sponge resulted in non-union, while rhBMP-2 treatment yielded the formation of a periosteal callous and new bone remodeling. Animals recovered well after implantation, and external fixation proved successful in stabilizing the femoral defects over 12 weeks. This streamlined surgical model could be readily applied to study bone healing and test new orthopedic biomaterials and regenerative therapies in vivo. Orthopedic trauma surgery focuses on treating a wide range of complex fractures. Critical diaphyseal segmental bone defects have proven difficult to treat clinically due to the decreased regenerative ability of the surrounding muscle and periosteum as well as the failure of localized angiogenesis1. Modern treatment techniques include operative fixation with bone grafting, delayed bone (Masquelet) grafting, bone transport, fusion, or amputation2,3,4. In most patients who have ambulatory function preserved after their trauma, with well-functioning distal limbs, limb salvage is clearly a better treatment option5. These salvage treatments often require staged surgical interventions over a long treatment course. 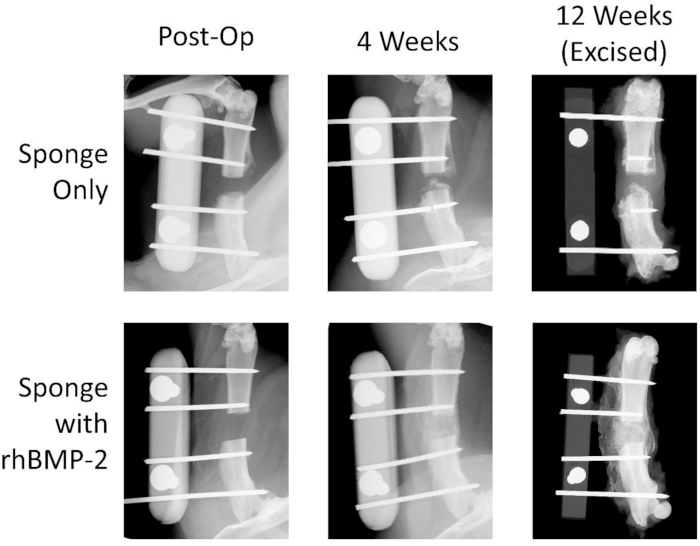 Some authors have suggested that external fixation is superior as compared to the internal fixation for these applications due to the decreased tissue damage during implantation, decreased implanted surface area, and increased postoperative adjustability of the fixator6. However, a prospective randomized controlled trial is currently underway to help clarify this controversy of internal versus external fixation in severe open fractures of the tibia7. Unfortunately, with either treatment selected, significant complication and failure rates persist8,9. With either treatment method, with respect to the segmental bone loss, the surgeon must contend with segmental diaphyseal defects that present significant challenges. Corrections of segmental defects must maximize bone stabilization and simultaneously enhance the osteogenic process10,11. Due to the clinical importance, yet the lower volume, of critical-sized diaphyseal segmental defects, an effective, reproducible animal model is necessary to enable research teams to advance treatment techniques and ultimately improve clinical outcomes. Researchers need to study in vivo physiologic healing mechanisms in a mammalian animal model. While such models of external fixation already exist12,13,14,15, we hope to provide a more reliable method for non-unions in the untreated animals, decrease costs through the choice of affordable fixator materials, and outline a straightforward surgical protocol for the easy application to future studies. The primary goal of this protocol is to establish a reliable and reproducible model of a critical diaphyseal defect in rats. The procedure was evaluated by assessing the stabilization and bone healing in rat femurs over 12 weeks. The secondary goals included: making an affordable model as a cost effective as possible, simplifying the surgical approach and stabilization, and ensuring ethical care of the animals. The authors and research team conducted preliminary experiments with a range of different biomaterials and potential regenerative therapies to improve healing in this segmental defect. The rats used in this study received daily care in accordance with the AVMA Guidelines for the Euthanasia of Animals: 2013 Edition16. The Institutional Animal Care and Use Committee at the University of Wisconsin-Madison evaluated and approved this experimental protocol before the project began. Use the outbred Sprague-Dawley male rats weighing approximately 350 g.
NOTE: Scaffold preparation should occur just before implantation in the femur (see Step 6.14). Follow manufacturer instructions for the use of an established rhBMP-2 bone graft kit containing a collagen sponge, lyophilized rhBMP-2, and sterile water for reconstitution17. Maintaining sterility, reconstitute the rhBMP-2 with the sterile water to a concentration of 1.5 mg/mL. Using sterile scissors and a sterile ruler, trim the rhBMP-2 soaked collagen sponge to reshape to fit a 5 mm x 3 mm x 3 mm defect. Using a syringe, distribute the rhBMP-2 solution evenly over the collagen sponge so that it is absorbed. NOTE: See Figure 1A for the more complete listing of dimensions. Cut aluminum sheet stock (type 6061, 0.088” thickness) to two pieces (1.4” x 6”) using a jigsaw or other appropriate tool. Mount one piece in the milling machine and, using a 1/8” 90°-point carbide drill mill, cut four 'V' grooves (0.035” deep) lengthwise. Leave the other piece free of cuts. Cut individual plates of 0.3” width from the two pieces (Figure 1B). Measure and drill screw holes for 4-40 thread. Tap plate with ‘V’ grooves with the 4-40 thread. Drill the plate without grooves for a #4 screw body drill. Sand both pieces to round corners and reduce weight (Figure 1C). Induce anesthesia by placing the rat in induction chamber delivering 4 L O2/min with 4% isoflurane. CAUTION: Research personnel must avoid inhalation of anesthetic gas and maintain proper hood and ventilation in the laboratory. Remove the rat from the chamber after the rat loses righting reflex, attach a nose cone and place at the maintenance dose of anesthesia through the nose (O2 delivery rate to 2-3 L/min and 0.8% isoflurane). Place the rat on the heating pad or under the warming light to prevent hypothermia. Confirm the adequate depth of anesthesia by pinching the toe or testing the palpebral reflex. Apply lubrication to eyes to prevent drying out of the cornea. Deliver a subcutaneous injection of extended-release buprenorphine (1 mg/kg) on the trunk/dorsum of the rat, far from the surgical site, to provide analgesia for up to 3 days following surgery. Shave area around hindleg using the 13th rib, the foot, the dorsal midline, and the ventral midline as margins. Scrub shaved area using sterile 2 x 2 gauze soaked with 10% povidone-iodine followed by 70% EtOH (4 times each, alternating). Administer an intramuscular injection of cefazolin (20 mg/kg) into the operative quadriceps. Administer enrofloxacin (0.25 mg/ml) in drinking water for 7 days postoperatively for continued antibiotic protection. Place rats on medicated feed (e.g., Uniprim) for the duration of the study to prevent pin tract infections. Apply double antibiotic ointment to the skin-pin interface once daily for 3 days postoperatively. NOTE: Avoid any external fixation pin or clamp loosening which can contribute to the development of an infection. NOTE: Make a concerted to effort to maintain a sterile field and workspace and follow sterile technique throughout the entirety of the case. Extend shaved leg through fenestrated, clear sticky drape and cover surgical bench in sterile towels to create a sterile field. Palpate the femur and use a #15 blade to create an anterolateral incision through the skin extending from the patella to the greater trochanter at the proximal femur. Carefully incise the lateral leg fascia along the intermuscular septum to separate the vastus lateralis muscle of the quadriceps anteriorly from the hamstrings posteriorly until the lateral femur is exposed. Preserve the abductor gluteal tendon insertion on the greater trochanter. Perform a careful, atraumatic circumferential soft tissue dissection and expose the femur at its mid-diaphysis starting on the lateral surface. To do this, use a #15 blade to gently cut the muscle away from the underlying bone by keeping the blade parallel against the contour of the bone surface. Use a periosteal elevator to lift the muscle away from the exposed bone as it is dissected and proceed around the femoral shaft until 7-10 mm of central diaphysis has been cleared of soft tissue on all sides to prepare for ostectomy. NOTE: Avoid injury to the medial femoral neurovascular bundle. Insert four 1.0 mm Kirschner (k) wires: 2 proximal and 2 distal in the femur perpendicular to the lateral femur, directed straight lateral to medial. Ensure all pins engage both cortices (bicortical) for adequate stability (Figure 2A). Start with the distal-most pin first, just at the level of the lateral epicondyle. Place jig flush to the lateral distal femur and insert a 1.0 threaded tip k-wire. Maintaining the position of the jig on the bone, identify where the most proximal pin will enter the bone based on the jig holes. Once the position is determined, carefully incise parallel to the fibers of the gluteal tendon as needed to create a small gap in the tissue for the proximal pin to pass through, thus minimizing iatrogenic damage to the tendon. Drill a 1.0 mm non-threaded k-wire in this gap, again ensuring the pin engages both cortices (Figure 2B). Maintain the jig’s position in contact with the bone and drill two 1.0 mm threaded k-wires, one on either side of the future defect site. Ensure pins engage both cortices (Figure 2C). Place the external fixator bar level 1 cm above skin and screw tightly, locking the bar in place. Clip the excess pin lengths (Figure 2D). Prepare for the ostectomy (defect creation) by placing a small, curved retractor around the anterior and posterior femur to protect the surrounding soft tissue, muscle, and neurovascular bundle. Utilizing a ~5 mm sagittal oscillating saw blade, very cautiously create a 5 mm segmental defect through the mid-diaphysis. Apply a light, even pressure with the saw to avoid unnecessary fracture (Figure 2E). Apply small amounts of irrigation (room temperature 0.9% sterile normal saline (NS)) as needed while creating defect to avoid thermal necrosis of the bone. Flush the wound using 10 mL of NS after creating the defect. Administer 0.1 mL of a 0.25% bupivacaine with epinephrine (1:200,000) to the wound as an analgesic and vasoconstrictor. Insert the scaffold (5 mm x 3 mm x 3 mm) of collagen sponge or rhBMP-2 soaked sponge (from Step 2) into the defect. Each scaffold should be sized appropriately to span the length and volume of the defect, helping the sponge stay in position. NOTE: At this point, mRNA complexes may be prepared and injected as outlined in Steps 7.1-7.3 below if performing bioluminescence imaging. Close the muscle plane using the simple interrupted pattern with 4-0 absorbable suture. Close the skin layer using a running subcuticular pattern with 4-0 absorbable suture and skin glue to close gaps around the protruding pins. Remove the rat from the nose cone, remaining on the heating pad, and monitor continuously until the rat is able to consistently maintain an upright posture. At this point, place in a clean cage to recover. NOTE: Transfection with mRNA complexes should be performed during surgery 1 day before luminescence imaging. Use sterile techniques when handling mRNA. Mix 10 µL of mRNA encoding for Gaussia luciferase (stock concentration of 1 µg/µL) with 30 µL of the lipidic transfecting agent. Allow for the mRNA-lipid complexes to form by incubating for at least 5 min at room temperature. The lipidic transfecting agent will condense the mRNA molecules, stabilizing them and enhancing transfection efficiency. NOTE: If the complexes are not used immediately, store them in ice for a maximum of 1 h.
Using a 20 µL pipette equipped with filtered tips, inject half of the volume of mRNA complexes to the distal and proximal ends of the defect, respectively. The following day, 3 min before imaging, anesthetize the rat using inhaled isoflurane as previously described in Step 4.1. 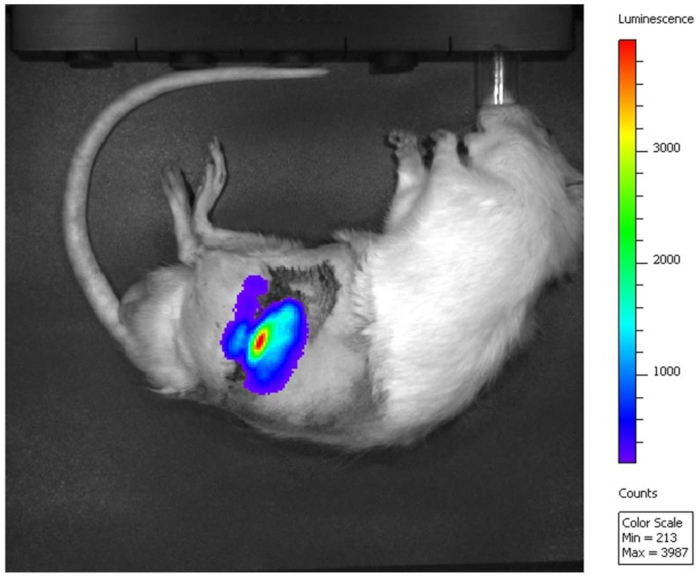 Position the rat in an in vivo imaging chamber equipped with a nose cone delivering maintenance isoflurane (0.8% isoflurane, O2 delivery rate of 2-3 L/min). Inject coelenterazine resuspended in saline at a dose of 4 mg/kg body weight in the proximity of the defect. Acquire bioluminescence images with the in vivo imaging system (IVIS) according to the manufacturer’s instructions18. After calibrating the plain radiographic machine, an X-ray system19, anesthetize rat using inhaled isoflurane as previously described (see Step 4.1) and position the rat in a nose cone with inhaled isoflurane (0.8% isoflurane, O2 delivery rate of 2-3 L/min) for an anteroposterior (AP) femur radiograph. While the rat is in sternal recumbency, advance the surgical hindlimb forward, flexing at the hip and stifle joint. Flex the stifle joint to approximately 90°. Tape the paw plantar side down, close to the body wall. Position the tibia forward from the femur to eliminate the possibility of superimposing the bones. To provide slight abduction of the hip, place a translucent sponge (approximately 15 mm thick) in the groin region. Then obtain an anterior-posterior (cranial-caudal) image of the femur. Repeat this AP femur radiographic view immediately following surgery, 4 weeks, and 12 weeks. Use tape and gauze to appropriately position the animal’s extremity for quality and consistent imaging. Remove the rat from the nose cone and monitor continuously until the rat is able to consistently maintain an upright posture. Then, place back into the cage. Euthanize rats in a chamber with inhaled CO2 according to AVMA ethical standards16. Following euthanasia, shave the hindlimb, remove the skin from the operative extremity and disarticulate femur at the hip. Carefully remove all soft tissue from the operative femur (including all muscles, tendons, and ligaments). Leave only a thin layer of muscle surrounding the defect site to protect the healing region from inadvertent damage during dissection. Place the femur in 10% Neutral Buffered Formalin at room temperature for 3-4 days to allow for fixation. Keep a 15:1 formalin to tissue volume ratio. Change the solution once halfway through the fixation process. Decalcify the femur in a 15% Ethylenediaminetetraacetic acid (EDTA) pH 6.5 solution for 3-4 weeks. Collect serial radiographs to determine decalcification endpoint. Bisect the femur longitudinally with a cut from anterior to posterior in the mid-sagittal plane. Submit tissue for standard paraffin embedding and hematoxylin and eosin (H&E) staining. Send H&E slides to a pathologist for histological assessment. Surgeries were performed in approximately one hour by one surgeon with the help of one assistant. 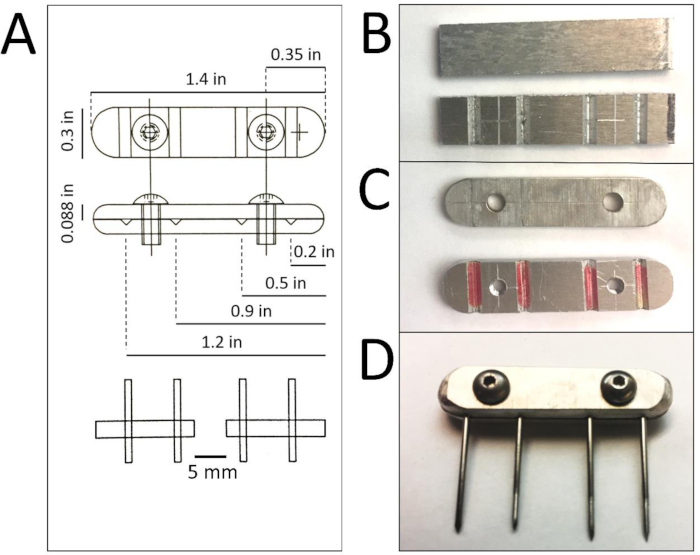 After surgical optimization, intra- and postoperative complications were greatly minimized and use of the jig apparatus ensured consistent size (5 x 3 x 3 mm) and localization of femoral defects. Rats were ambulatory immediately following recovery from anesthesia and did not appear to have any altered behavioral patterns; their gait was not antalgic, and they did not appear to be disturbed by the external fixator. Non-threaded k-wires were chosen for the most proximal pin (Figure 2B), as the proximal pin had the highest risk of breaking when threaded wires were used. In some instances, particularly in control animals without rhBMP-2 or scaffolds whose defects showed no evidence of healing/bone formation, one or more k-wire tips broke after about 8 weeks as seen in the sponge only control radiograph of the excised femur (Figure 3). Radiographs and histology (H&E stain) were analyzed to assess levels of bone healing. 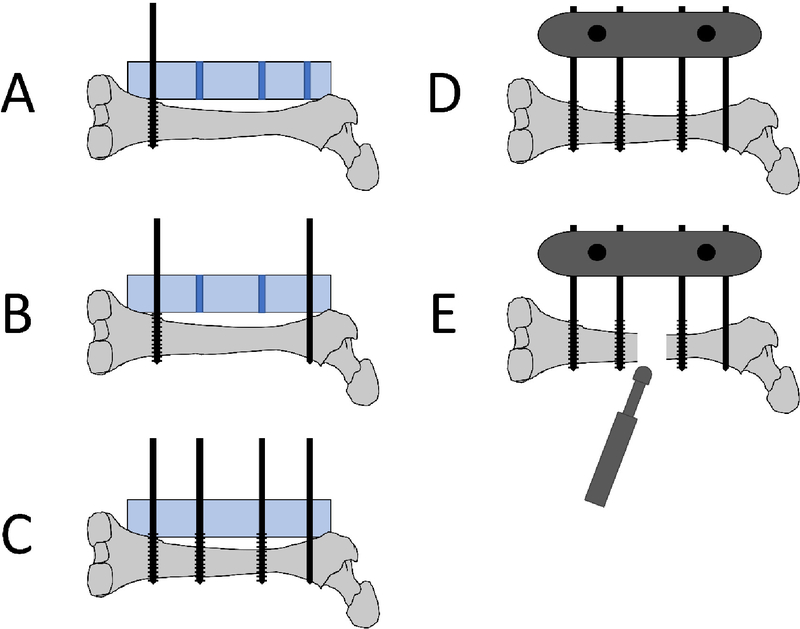 Negative control defects containing only a collagen sponge showed no evidence of bridging osteogenesis between the proximal and distal bone edges (Figure 3, Figure 4). A small amount of new bone remodeling can be seen directly adjacent to the cut femur edge; the defect itself shows a lack of bony material, the presence of cartilage, and some residual hematoma (Figure 4). Defects containing rhBMP-2 soaked sponge demonstrated significant bone healing as early as 4 weeks after surgery, as shown by the radiopaque callous bridging across the defect in Figure 3. By 12 weeks, significant new mineral deposition (Figure 4, NB: new bone, PC: periosteal callous) has formed throughout the defect. Significant new periosteal bone can be seen in the callous extending from the cut femur edge, and spicules of woven and lamellar bone have developed throughout the defect. Cartilage deposition is not seen (Figure 4). Histology (H&E stain) was also performed for both an uninfected control and an example of an infected femur (Figure 5). The infected femur is significantly enlarged, showing signs of an endosteal reaction infiltrating the bone cortex. Arrows indicate areas of osteoclast-mediated pathologic bone resorption. The uninfected femur cortex remains compact and with a clearly delineated lamellar cortex. Antibiotic dosing was optimized to include maximal coverage postoperatively. While infection around the defect site can occur, continued administration of antibiotics topically around pin sites and in water and diet proved successful in minimizing postoperative infection. Further imaging using In Vivo Imaging System (IVIS) illustrates the ability of bioluminescent cells to be visualized within the defect after implantation of the external fixator (Figure 6). The external plate can be easily removed for imaging and replaced upon completion. Cells in the medullary cavity luminesce after transfection with complexed mRNA encoding for Gaussia luciferase. The highest level of luminescence is focused at the site of the femoral defect and the signal is not obstructed by the fixation device pins. This is promising for future studies relying on bioluminescence or fluorescence to measure biological changes such as a gene or protein expression during the healing process. Figure 1: External fixator fabrication. A: CAD schematic of the assembled external fixator with annotated dimensions for proper fabrication. Each fixator is composed of two aluminum plates held together by two screws. B: Plates are cut from 1.4” x 6” aluminum sheets with ‘V’ grooves cut into the bottom sheet. C: Screw holes are drilled into the plates (threaded in the plate with ‘V’ grooves) and all edges and corners are sanded to round and reduce weight. D: Assembled external fixator is tightened with screws (4-40 x 0.25”, 18-8 stainless steel button head cap) once pins are in place in the ‘V’ grooves on the insides of the aluminum plates. The left pin is non-threaded and is most proximal on the femur. Please click here to view a larger version of this figure. Figure 2: Schematic of pin placement, fixator placement, and defect creation. A: The distal pin (1.0 mm threaded k-wire) is placed at the epicondyle metaphyseal region using the jig (blue rectangle) to guide proper pin insertion. The jig is placed onto the anterolateral femoral surface. B: The proximal pin (1.0 mm non-threaded k-wire) is placed using the jig after making a small incision in the gluteal tendon. C: The middle pins (1.0 mm threaded k-wire) are inserted using the jig. D: The jig is removed and the 2 plates are attached to the pins using the 2 screws to secure the plates. The plates are tightened 1 cm above skin level to avoid pressure on the skin. E: A sagittal oscillating saw is used to create a 5 mm defect between the two middle pins. Please click here to view a larger version of this figure. Figure 3: Representative high-resolution radiographs show bone healing with rhBMP-2 treatment. Images for the negative control collagen sponge and the rhBMP-2 soaked sponge groups are shown at 0, 4, and 12 weeks postoperatively. The rhBMP-2 treatment group exhibits significant healing after 4 weeks with callous spanning the defect. The negative control femur ends do not heal with bridging bone and the defect remains a non-union. Please click here to view a larger version of this figure. Figure 4: Significant new bone formation is seen with rhBMP-2 treatment. Representative 4x magnified H&E histological images for the negative control collagen sponge and the rhBMP-2 soaked sponge groups both at the cut femur edge and within the defect. New bone formed around the control femur edge, but significant extensions of both new trabecular bone as well as the periosteal callous project from the treated femur. No bony material is seen within the control defect, while significant bone formation can be observed throughout the rhBMP-2 treated defect. NB: new bone, F: femur, C: cartilage, H: hemorrhage, PC: periosteal callous. Scale bar: 200 µm. Please click here to view a larger version of this figure. Figure 5: Infected femur exhibits hypertrophy and inflammatory cell markers. H&E histological images of an uninfected femur compared to an infected femur, in full view and at 4x magnification of boxed locations. The uninfected femoral cortex remains organized and delineated, with little sign of inflammation. The infected femur enlarges greatly, as seen in full view, and the cortex is broken up by areas of resorption and necrosis (purple cell clusters indicated by black arrows). F: femur. Scale bar: 200 µm. Please click here to view a larger version of this figure. Figure 6: Gaussia luciferase signal detected in the defect. Luminescence of cells transfected with Gaussia luciferase mRNA is imaged with IVIS after external plate removal. Red indicates the highest luminescence intensity at the site of the femoral defect. Please click here to view a larger version of this figure. Small animal models of orthopedic injuries such as complete bone fractures enable research that explores the mechanisms of osteogenesis and assessing the therapeutic potential of biomaterials20. This study introduces a rat segmental defect model stabilized by a custom external fixator that a lab and biomedical engineering team can readily reproduce for further studies of load-bearing osteosynthetic bone repair. Previous studies using critical-sized defects in rat models commonly rely on internal fixation plates21,22,23,24. Although either fixation method is clinically acceptable, external fixation has the distinct advantages of causing less soft tissue disruption and blood loss, decreasing the total implanted surface area to minimize opportunities for bacterial colonization, and allowing for postoperative adjustability and staged surgical interventions6. Previous external fixation animal fracture models have used different plate materials, pin securement, and/or bone cutting methods12,13,14. Because the external fixator in this protocol was made in the lab’s workshop with low-cost aluminum and can be easily refurbished, expenses were minimized. This provides an economical external fixator allows researchers to perform experiments with multiple animal groups without being limited financially. As compared to an internal fixation model, we believe that this system is technically simpler and more reproducible in a small animal model. In our experience with these models, internal fixation is significantly more demanding technically and can require custom-machined implants. To the authors’ knowledge, this overall protocol is unique in its use of a custom-designed jig combined with an adapted metal external fixator design15, as well as its use of an oscillating bone saw to better represent the common clinical scenario of periosteal stripping performed to prepare fracture sites for fixation. A final note on the use of an oscillating saw in this model is that the heat generated and the periosteal disruption that occurs provides a final element of control in forming a non-union model. Our experience has been that with other methods, in these animal models, investigators run the risk of the controls healing. To ensure surgical success, care should be taken at several critical steps: when incising and performing the circumferential dissection to expose the femur from surrounding muscle, avoid disturbing the sciatic nerve caudally, the femoral vessels medially, and the gluteal tendon proximally. Take care to position the jig apparatus parallel and flush against the flat, anterolateral face of the femur so that all pins are precisely perpendicular to the bone. This will confirm the proper alignment of the external fixator and reduce the likelihood of pin breakage. The order of pin placement found to be most straightforward was distal first, followed by proximal and then both middle pins. This allowed for less disruption of the gluteal tendon by the proximal pin. Finally, it is important that each pin is placed bicortically, penetrating both cortices so that it does not back out of the bone or shift into the medullary cavity. An x-ray machine capable of high-resolution radiography was used to monitor bone-healing status as qualitative changes can be visualized easily and non-invasively over time. However, consistent leg positioning is crucial for accurate radiographic interpretation as differences in positioning may be misleading. 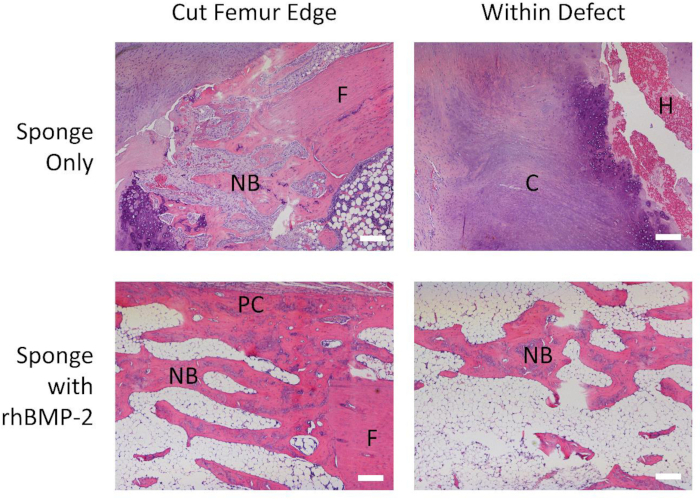 Results from this study are in agreement with previous work demonstrating that a 5 mm femoral defect prevents spontaneous bone healing in normal rats25. Therefore, any healing that is noted with added therapies such as the rhBMP-2 soaked sponge can be definitively attributed to the respective treatment (Figure 3). Possible concerns for this technique include pin breakage, loosening, and infection. Problems with proximal pin breakage in preliminary testing prompted a switch from threaded to non-threaded k-wire. Non-threaded pins are mechanically stronger but also pose more risk of backing out of the cortex. Particularly in empty bone defects, k-wires may break or be displaced around 8 weeks due to the prolonged cyclic pin loading and lack of healing (similarly to cycling/bending a paperclip). A strict antibiotic regimen was utilized to include an immediate cefazolin injection, daily application of antibiotic ointment at the incision site, 7 days of enrofloxacin added to drinking water, and a medicated feed. This antibiotic protocol, along with the proper surgical techniques outlined above, minimized infection (Figure 5). One of the additional advantages of using external fixation in an animal model is easy removal for an unobstructed view of the defect and replacement after imaging. This enables more effective in vivo imaging techniques relying on fluorescence or luminescence to assess changes such as the gene or protein expression. For instance, we have shown that cells in the medullary cavity transfected with complexed mRNA encoding for Gaussia luciferase could be visualized with IVIS. Figure 6 illustrates that luminescence signal detection capability is not obstructed by this external fixation approach as it may be with internal plates, screws, or intramedullary nails21,22,23,24. This cost effective and reproducible surgical protocol allows for consistent creation and stabilization of a critical-sized femoral defect that mimics the initial clinical management of these complex fractures. The establishment of a reliable animal model is critical for any experimental treatments intended for eventual clinical use. Our model has demonstrated predictable results and minimal behavioral changes or discomfort in our animals. This model may be used with a variety of biomaterial-based scaffolds in conjunction with the imaging techniques utilized in this paper for future translational testing purposes. It is our hope that in working with this model, researchers will be able to devise novel ways to treat critical bony defects in trauma patients. This could help avoid the morbidity and cost in lengthy treatments currently employed and possibly decrease the number of amputations. The authors declare no competing financial interests or benefits. There have been no benefits received directly or indirectly by the authors of this article. This work was supported by an NIH Equipment Grant 1S10OD023676-01 with additional support provided through the University of Wisconsin’s Departments of Orthopedics and Rehabilitation and School of Medicine and Public Health. We wish to acknowledge the UW’s Carbone Cancer Center Support Grant P30 CA014520 and use of their Small Animal Imaging Facility, as well as NIH Training Grant 5T35OD011078-08 for support of H. Martin. We also thank Michael and Mary Sue Shannon for their support of the Musculoskeletal Regeneration Partnership. Filipowska, J., Tomaszewski, K. A., Niedźwiedzki, Ł, Walocha, J. A., Niedźwiedzki, T. The role of vasculature in bone development, regeneration and proper systemic functioning. Angiogenesis. 20, (3), 291-302 (2017). Charalambous, C. P., Akimau, P., Wilkes, R. A. Hybrid monolateral-ring fixator for bone transport in post-traumatic femoral segmental defect: A technical note. Archives of Orthopaedic and Trauma Surgery. 129, (2), 225-226 (2009). Xing, J., et al. Establishment of a bilateral femoral large segmental bone defect mouse model potentially applicable to basic research in bone tissue engineering. The Journal of Surgical Research. 192, (2), 454-463 (2014). Chadayammuri, V., Hake, M., Mauffrey, C. Innovative strategies for the management of long bone infection: A review of the Masquelet technique. Patient Safety in Surgery. 9, (32), (2015). Koettstorfer, J., Hofbauer, M., Wozasek, G. E. Successful limb salvage using the two-staged technique with internal fixation after osteodistraction in an effort to treat large segmental bone defects in the lower extremity. Archives of Orthopaedic and Trauma Surgery. 132, (19), 1399-1405 (2012). Fragomen, A. T., Rozbruch, S. R. The mechanics of external fixation. The Musculoskeletal Journal of Hospital for Special Surgery. 3, (1), 13-29 (2007). O’Toole, R. V., et al. A prospective randomized trial to assess fixation strategies for severe open tibia fractures: Modern ring external fixators versus internal fixation (FIXIT Study). Journal of Orthopaedic Trauma. 31, S10-S17 (2017). Fürmetz, J., et al. Bone transport for limb reconstruction following severe tibial fractures. Orthopedic Reviews. 8, (1), 6384 (2016). Dohin, B., Kohler, R. Masquelet’s procedure and bone morphogenetic protein in congenital pseudarthrosis of the tibia in children: A case series and meta-analysis. Journal of Children's Orthopaedics. 6, (4), 297-306 (2012). Einhorn, T. A., Gerstenfeld, L. C. Fracture healing: Mechanisms and interventions. Nature Reviews Rheumatology. 11, 45-54 (2015). Pascher, A., et al. Gene delivery to cartilage defects using coagulated bone marrow aspirate. Gene Therapy. 11, (2), 133-141 (2004). Glatt, V., Matthys, R. Adjustable stiffness, external fixator for the rat femur osteotomy and segmental bone defect models. Journal of Visualized Experiments. (92), (2014). Betz, O. B., et al. Direct percutaneous gene delivery to enhance healing of segmental bone defects. The Journal of Bone and Joint Surgery. 88, (2), 355-365 (2006). Fang, J., et al. Stimulation of new bone formation by direct transfer of osteogenic plasmid genes. Proceedings of the National Academy of Sciences of the United States of America. 93, (12), 5753-5758 (1996). Kaspar, K., Schell, H., Toben, D., Matziolis, G., Bail, H. J. An easily reproducible and biomechanically standardized model to investigate bone healing in rats, using external fixation. Biomedizinische Technik. 52, (6), Berlin. 383-390 (2007). Leary, S., et al. AVMA guidelines for the euthanasia of animals: 2013 edition. American Veterinary Medical Association. (2013). McKay, W. F., Peckham, S. M., Badura, J. M. A comprehensive clinical review of recombinant human bone morphogenetic protein-2 (INFUSE Bone Graft). International Orthopaedics. 31, (6), 729-734 (2007). Living lmage Software. Perkin Elmer. (2006). Bassett, J. H. D., Van Der Spek, A., Gogakos, A., Williams, G. R. Quantitative X-ray imaging of rodent bone by faxitron. Methods in Molecular Biology. 499-506 (2012). Histing, T., et al. Small animal bone healing models: Standards, tips, and pitfalls results of a consensus meeting. Bone. 49, (4), 591-599 (2011). Lieberman, J. R., et al. The effect of regional gene therapy with bone morphogenetic protein-2-producing bone-marrow cells on the repair of segmental femoral defects in rats. The Journal of Bone and Joint Surgery. 81, (7), 905-917 (1999). Tsuchida, H., Hashimoto, J., Crawford, E., Manske, P., Lou, J. Engineered allogeneic mesenchymal stem cells repair femoral segmental defect in rats. Journal of Orthopaedic Research. 21, (1), 44-53 (2003). Jiang, H., et al. Novel standardized massive bone defect model in rats employing an internal eight-hole stainless steel plate for bone tissue engineering. Journal of Tissue Engineering and Regenerative Medicine. 12, (4), 2162-2171 (2018). Baltzer, A. W., et al. Genetic enhancement of fracture repair: Healing of an experimental segmental defect by adenoviral transfer of the BMP-2 gene. Gene Therapy. 7, (9), 734-739 (2000). Li, Y., et al. Bone defect animal models for testing efficacy of bone substitute biomaterials. Journal of Orthopaedic Translation. 3, (3), 95-104 (2015).